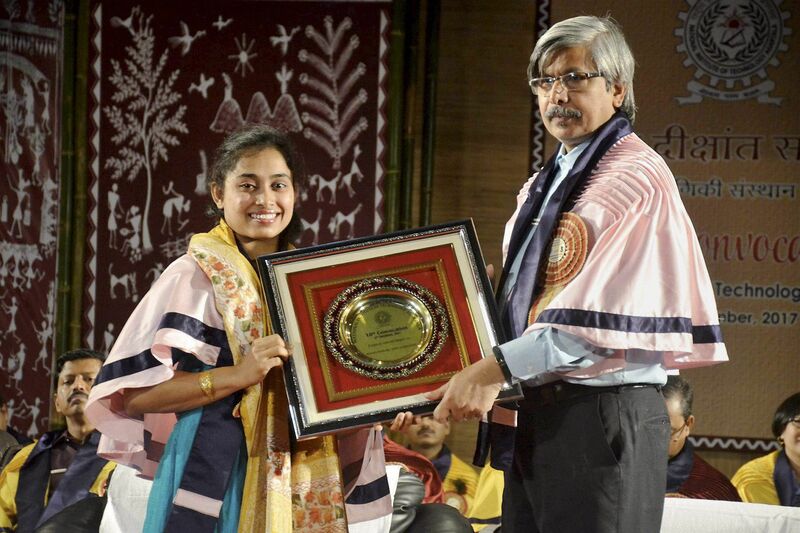 Agartala, Nov 12: India's star gymnast Dipa Karmakar, who narrowly missed out on a bronze medal in the women's vault event at the Rio Olympics last year, was on Saturday conferred a D.Litt. degree by the National Institute of Technology (NIT), Agartala. The 24-year-old Tripura girl, who became the first Indian woman gymnast to qualify for the Olympics, finished fourth in the final round of the women's vault event at the Rio Olympics Games in Brazil last year. Dipa's father Dulal Karmakar told IANS that his daughter is now preparing for the 18th Asian Games in Indonesia's Jakarta and 21st Commonwealth Games to be held in Australia's Gold Coast. Besides Dipa, the NIT also conferred D.Sc. degree upon IIT Guwahati Director Goutam Biswas and Jadavpur University professor Biswajit Ghosh at its tenth convocation held on Saturday. Degrees were given to 950 students and 31 Ph.D scholars. Twenty students, including 11 girls, were given gold medals in various academic branches of the institute. National Institutional Ranking Framework and National Board of Accreditation Chairman Surendra Prasad gave the convocation address while NITA Director Ajoy Kumar Roy awarded the degrees to the students. The NIT honoured Bollywood actor Nana Patekar with a D.Litt. degree and Governor Tathagata Roy with D.Eng at last year's convocation.